Tomatoes are typically pollinated by honey bees and pollen carried by wind. If you live in the Southern portion of the United States, in a state bordering Mexico, you may not have many honey bees. Due to efforts to control Africanized bees (yes, the same bees known as Killer Bees), bee hives in residential areas are immediately removed. You can pollinate the flowers yourself. Use your finger tip, or a Q-tip, swab around an open flower, then swab another flower, then another and so on. 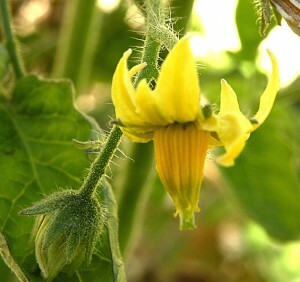 This will help you achieve a higher rate of flower pollination, resulting in a larger crop of tomatoes. A word about temperature and pollen: It is believed that tomato pollen becomes sterile at temperatures above 90 degrees F. The cure for this is hand pollinating your flowers in the morning, before the air temperature gets too hot. This is a great tip for those who live in the desert and the South, as it can extend your harvest season greatly.